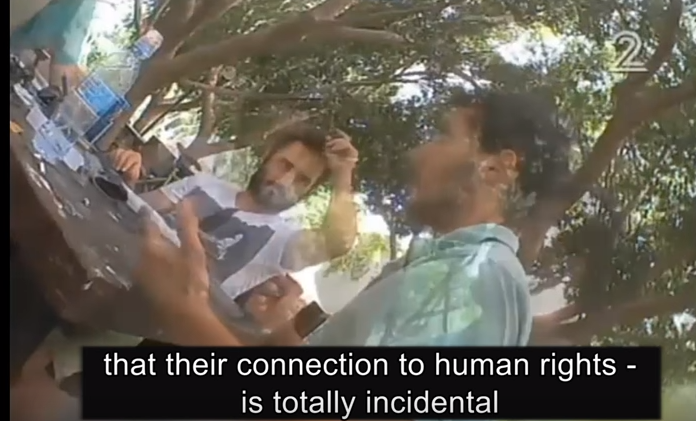 Two weeks ago we reported about the Israeli Channel 2 report showing how “Breaking the Silence” asks many questions from former soldiers that had nothing to do with human rights and sound a lot like intelligence gathering against Israel. It is fascinating to see how the Left is defending this. At first, Haaretz put out a sarcastic piece that was remarkably fact-free and that ignored the charges in the story. But then the newspaper came up with a novel defense of apparent treason: The information collected was not that sensitive! Haaretz believes that treason is OK if it is only minor treason. It is not concerned that the information is being passed on to BtS’ European funders or to the Palestinian Authority. Israeli soldiers have been convicted of posting similar secrets on social media without realizing the gravity of the issue. But to Haaretz, an organization dedicated to slandering the IDF is above such petty concerns as espionage. Breaking the Silence, for its part, responds that all of its reports are cleared by the military censor so therefore it cannot be guilty. But espionage is not usually published. The concern is what Breaking the Silence is doing with the classified information it is gathering, not whether it is publishing secrets. Is it sharing the raw footage and interviews with its European funders? Is it passing information on to groups that encourage violent Palestinian demonstrations? These are the questions that the Shin Bet is now investigating. But seeing how these Israeli groups are defending apparent espionage against the State puts a lie to the idea that they are animated by their patriotism and their desire to improve the army.